I have to start be saying I’m absolutely delighted to be entering my second year as a Netflix Streamteam member. I love television shows and movies! and I always struggle between watching shows I already know well, and love, and discovering new ones…and all without adverts. So Netflix just ticks all the boxes for me. But enough about me, I have wanted to do a kids’ show post for the whole summer, but haven’t, so I guess there’s really no time like the present. This is in no particular order, it’s just as I remember them. I love this show probably more than Roz. It’s based around a nine year old Sister and her four year old brother who have adventures with their dog Fred. Stella has a quirky answer (usually completely make believe) for all of Sam’s questions and the fun thing they get to do are based on everyday childhood that will just warm your heart. My favourite was when Stella took Sam and his best friend to the north Pole one winter day ( the hill beside their house) just because the snow and the music was so mellow. Yes, I even have a favourite episode. Imaginative 9-year-old Stella is a star in the eyes of 4-year-old brother Sam, who feels lucky to have a big sister like her. Not only does Stella include Sam in all the fun things she does, but she knows everything — or, at least, that’s what it seems like to a 4-year-old — and uses her knowledge to help out little bro during his frequent exploring outings. Sam is quick to explore beyond the walls of his house … as long as someone else goes first. The adventure-filled animated series is based on a children’s book series by Marie-Louise Gay just in case anyone wants to get them. They are just as lovely as the series. For a very long time, I thought puffins were imaginary birds. They just didn’t seem real. I was delighted when I finally got to go to Skellig Michael and see them with my own eyes. So this show just makes me feel warm and fuzzy inside. Not one of my favourite, but Roz loves it. Based on the movies of the same name, Eep, Grug, Thunk, Ugga, Sandy and Gran are back and funnier than ever in this all-new family sitcom. Follow everyone’s favourite family as they meet new friends, outrun new creatures and encounter “firsts” the world has never seen – such as school, slumber parties, hiccups and elections. 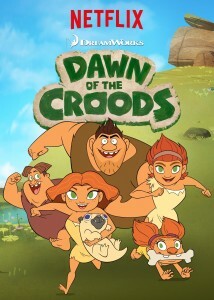 The Croods are discovering them all. 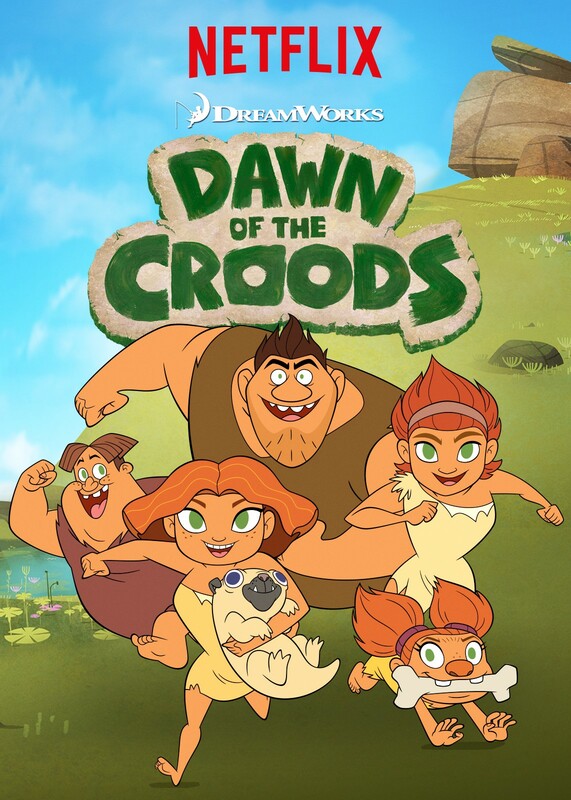 Dawn of the Croods will be available exclusively on Netflix in all current territories except Germany and Japan. We have loved this show for a very long time. Krzys introduced it to us in Russian on YouTube and we would gorge on the episodes. You didn’t need to know even one word of Russian to enjoy it. We just got a lot of kicks from the bear’s “hé!” exclamations. Well, it’s now on Netflix with English dubbing and is just as enjoyable. Centering around a little girl who befriends a bear…I guess torments the bear would be more accurate, it’s a lovely show filled with every day adventures about friendship. From Masha’s favourite game of playing doctor to all the various animals to the bear constantly trying to keep her out of mischief, it’s a joy to watch for all ages. And the cuteness of Masha! The cuteness! We love How to train your dragon in our house, and are delighted at the Netflix series. Family favourites Hiccup and Toothless are back and on a mission: to change the world. On their adventures they discover the Dragon Eye, an ancient artefact that unlocks secrets. But soon after the friends are targeted by hunters, who will stop at nothing to steal their treasure. It was two years ago when Roz saw this at my sister’s house. When she saw it on Netflix, she remembered. How? like seriously, how? she was three? But hey, she remembered. It’s more suitable to 7-13 year olds. The main characters are Corey, Laney, and twin brothers Kon and Kin who are in a band together. The inspiration for their lyrics comes from Corey’s sister Trina who Corey usually causes to be angry, happy, in love or some other emotion. She then writes words in her diary that they use to create their songs. The one thing it made Roz see was that it doesn’t take much to sing. Krzys rigged up his amplifier and microphone and for a while there, she was a rock star, insisting on singing and even creating her own songs. Don’t ask. It was during my hazy illness that she discovered this and watched it till I banned it. It’s so ANNOYING!! It’s more appropriate for 8-11 year olds to be honest so if your child loves fart jokes and watching butts running around having adventures, then knock yourself out.